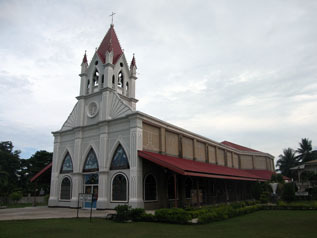 During the Spanish period, Santander was under the Immaculate Concepcion Parish in Oslob, Cebu. Local folks had to walk 18 kilometers to attend mass. Because of this distance, the people requested that another church be constructed and this was completed in 1898. Originally, the Santander church faced the sea but this was changed in 1960 to face the road for the convenience of the church goers. Taking into consideration, the distance from Santander to Oslob, the people requested the construction of a church. It was completed in 1898 and named it Saint Gabriel the Archangel Parish Church. The church of Santander not only serves as a place for religious veneration. This church, one of two in Cebu with their backs to the sea, is also a symbol of its people’s awakening that led Santander to where it is today. The Santander church was a refuge for its people in times of political persecution during the early 2000s, its priest vocal in being vanguards in the protection of its flock’s rights and interests. The Santander church was vital in winning the battle that freed Santander from the decades-long iron grip of its previous leaders and had its share of space in local newspaper reports because of it. Santander is the only town in Cebu province with St. Gabriel the Archangel as patron, known as the messenger of God. The town’s fiesta is celebrated in the month of April. It is said that when his image is taken out for procession, rain will fall even on a sunny day. All Rights Reserved. © 2009 - 2014 Municipality of Santander, Cebu, Philippines.